Started this thread viewtopic.php?f=45&t=119152 to get some discussion and thoughts down while I was prepping for my own BOC build. I think it is a great topic that hasn't been exhausted yet, certainly there is a lot of exploring and experimenting left to do on the subject. I have penciled out multiple copycat builds over the years, but most involved a level of fabrication I was not willing to fund or mooch off of friends. I'm a firm believer that if you just mull it over long enough a partially complete version can be found and adapted with much less effort then a ground-up build many times. With this project it didn't dawn on me until I recently upgraded my bike to a Surly Ogre. 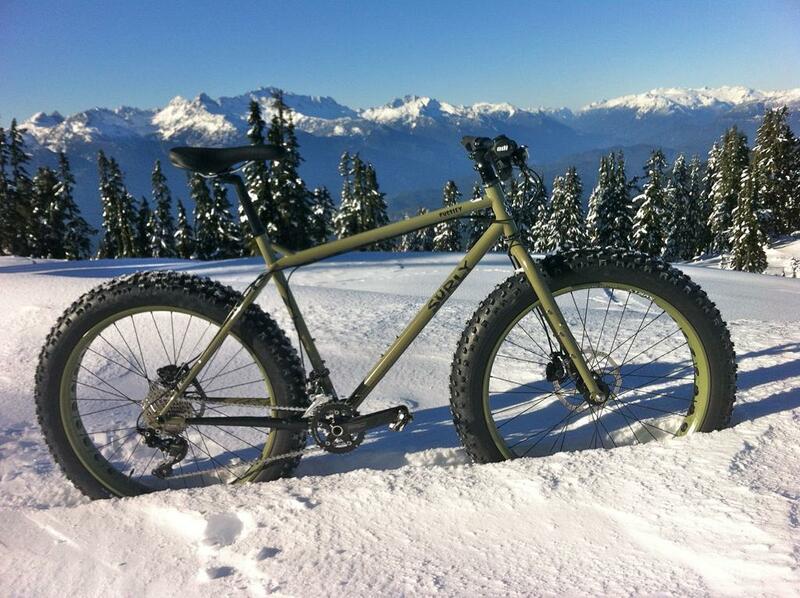 This bike has fork mounts for mounting bottle cages or cargo cages for bikepacking or touring. While brainstorming on just how much gear I could conceivably pack on a mountain bike front fork all the pieces fell into place. Within a few weeks I finally stopped by my local sketchy bike shop (the kind with piles of rusty bikes and employees with prison tats) and bought a pile of parts. Interestingly enough the guy at the shop caught on faster then I would have imagined, he mentioned using "hippy wheel barrows" to move large camps, which sounded a lot like the Game Tote cart from the resource thread. total cost was $40 out the door. doitnstyle1 hooked me up with a tube and some more brake parts and I was in business. assembly was pretty straight forward, I flipped the fork upside down so the (I assume) fender mounts where facing up for the rear rack. Drilled through the steer tube to mount the rear end of the rack. and just like that I'm off and running. Rack means easy pannier interface if that is your scene, drybags, milk crates or buckets could be lashed on as needed as well. Load stays centered over the wheel, steering and navigating stairs and obstacles is a snap since there isn't the tipiness from dual wheels. While I'd originally schemed on bolting jerry can carriers somehow I found just a single strap over the rack did the job just fine. Loading and filling them this way is annoying, but not hard. I was fully expecting to have to fill the cans a few gallons at a time going back and forth to keep the cart balanced (I don't have a kickstand for it, had to just hold it while they filled) but I actually got to about 4 gallons before I even noticed the cart pulling to one side much. It would seem balancing the load might be much less of an issue then I'd imagined. trying to set the cart down to go in for a soda wasn't ideal, not sure a kickstand would even work that well with 80lbs, but if the load can pivot a bit like these cans they can make contact before the cart is fully laid down. 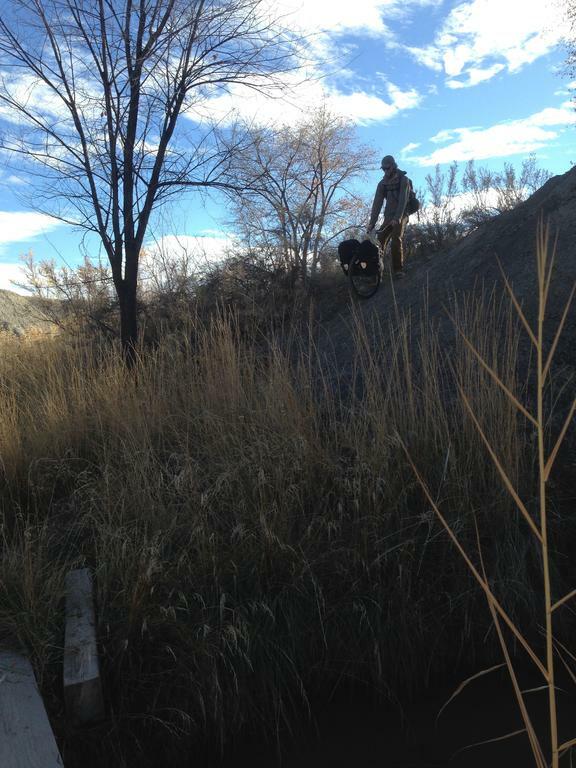 walking back proved a breeze, on flat paved ground you really can push 80lbs with two fingers. The way I had the load mounted it had some room to shift back and forth a bit and you could tell the difference, but there was a pretty good margin for error without really messing up the balance of the cart. On level ground the brakes aren't needed, stopping 80lbs was no work at all but of course hill testing is in the future. If I can haul 50lbs without really needing brakes I might just leave them off future versions. picking the proper bar and stem for this project required the most thought, and is about the only thing keeping any $20 bike at the thrift store from being a good candidate for a cart build. I really do think the swept back bars are the best option, and I wouldn't mind if these bars where longer. I found I had to adjust my stride a bit to keep from kicking the back of the tire, a longer stem could also fix the issue. Total weight of the cart is about 10.5 lbs, this and its relatively compact form give it a big advantage over some of the larger, bulkier carts out there. Popping the wheel off would make it very compact for keeping in a car for contingency transportation, and its light weight would make crossing terrain it couldn't navigate easier (stream crossings for instance). Conceivably a cart/packraft combination would open up a lot of terrain that would otherwise be untenable, even a 5lb raft is too great a burden for most backpacks unless the trip is planned around rafting, but with a cart a 5lb contingency option is much more easily accommodated. 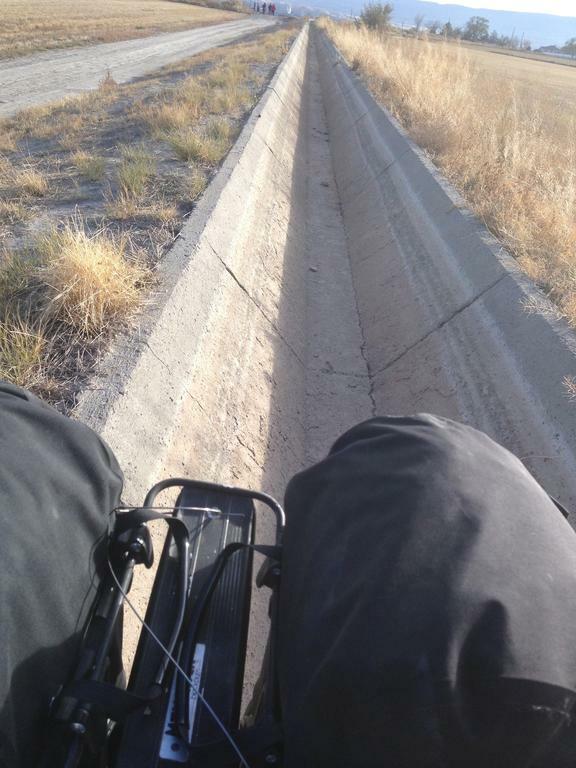 "Bikerafting" trips are increasing in popularity, but I feel a cart would have access to some more terrain then a bike would, filling a gap between bike and foot travel. Being made from 100% bike parts makes finding replacement parts a non-issue, and just building a new one from scratch requires little more then some allen wrenches so this is basically a disposable piece of gear, you're not out much if you have to ditch it somewhere. Sourcing an exotic ti or carbon fork is going to offer some weight savings, but for most that is going to be absurdly far down the cost/benefit ratio unless you have a good hookup on bike parts. I do wonder what a carbon fork/bar/rim combination would get the weight down too, possibly <5lb. Obviously this style of cart gives up a lot of load hauling options compared to a flat bed, two+ wheeled cart, but certainly anything you could carry easily in or on a pack could also be carried on one of these. Looking into some of the cargo racks from utility bikes might also give some easier loading options for bulky items as well. The main advantage is maneuverability, I think a one wheeled cart can go many places a two wheeler can't. There are some videos on the Pack Wheel site showing what navigating rougher terrain with a cart looks like, not a walk in the park but doable. 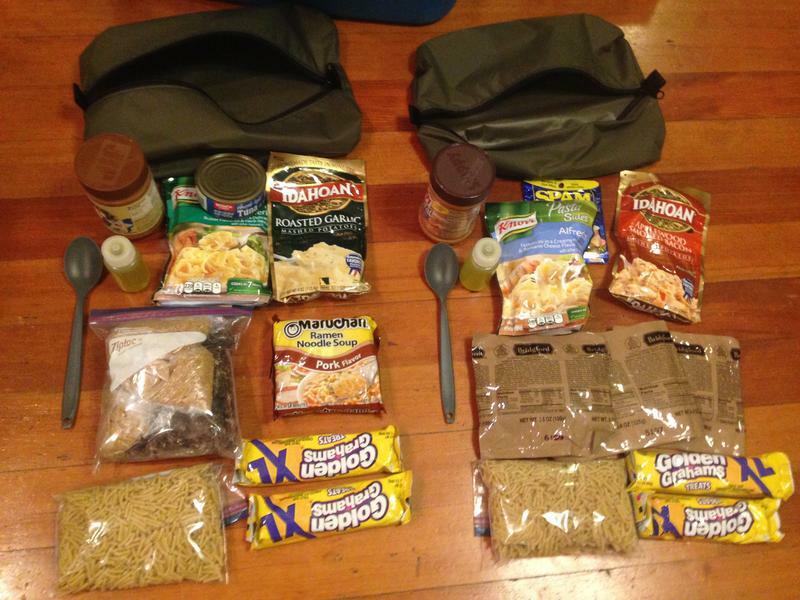 I plan to experiment with the cart as a range extender, a 20lb backpack with essentials and a few contingency items and a cart with 50lbs of consumables and a few comfort items has the potential to offer a tremendous range on foot as long as the route isn't too arduous, something like a 3-season pulk sled. Cool concept. You didn't mention too much about the brake. Is it positive control or more of a deadman set up? I was going to ask if brakes of any kind are even necessary, but I guess 80 lbs of anything could be challenging to control when descending steep terrain. 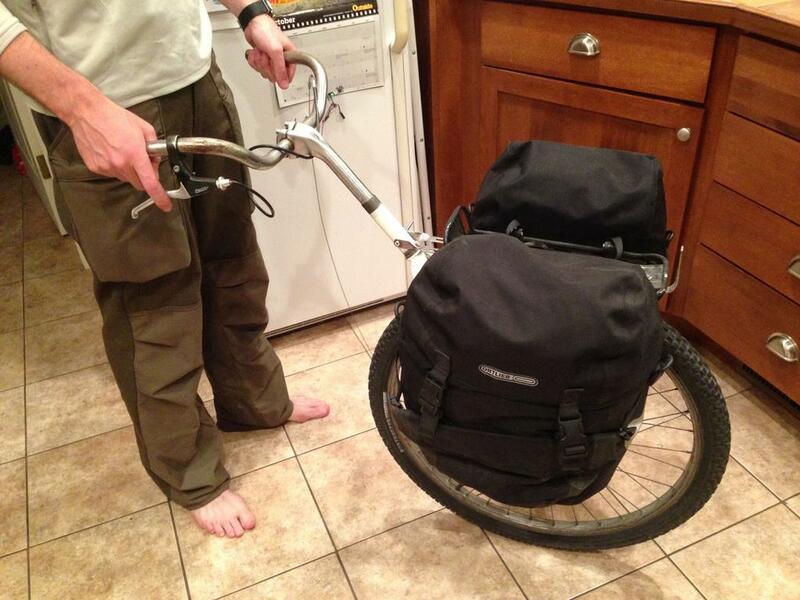 I wonder how this concept would work with low rider pannier racks? The load might balance better but I suppose there're be a pretty severe tradeoff in terms of ground clearance. Just normal bike brakes, I had wanted disk brakes but I couldn't find a disk compatible fork in the bin. 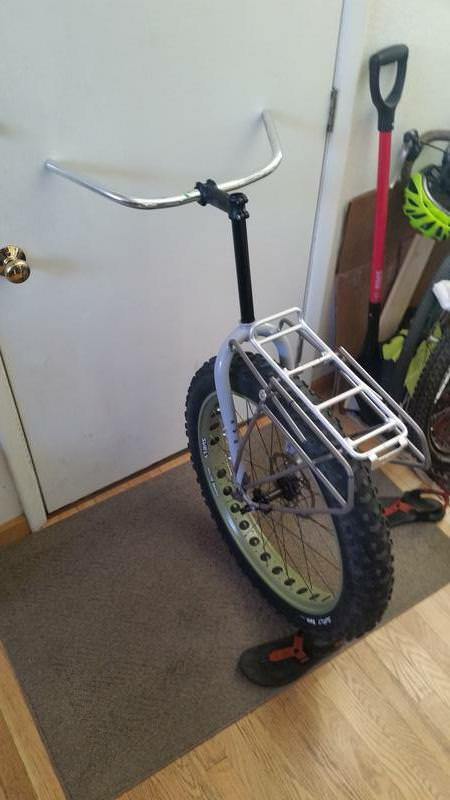 Since I would guess you would only really need brakes on downhills I do wonder what kind of drag brake you could build, something that you could just tilt the cart back a bit and dig in. 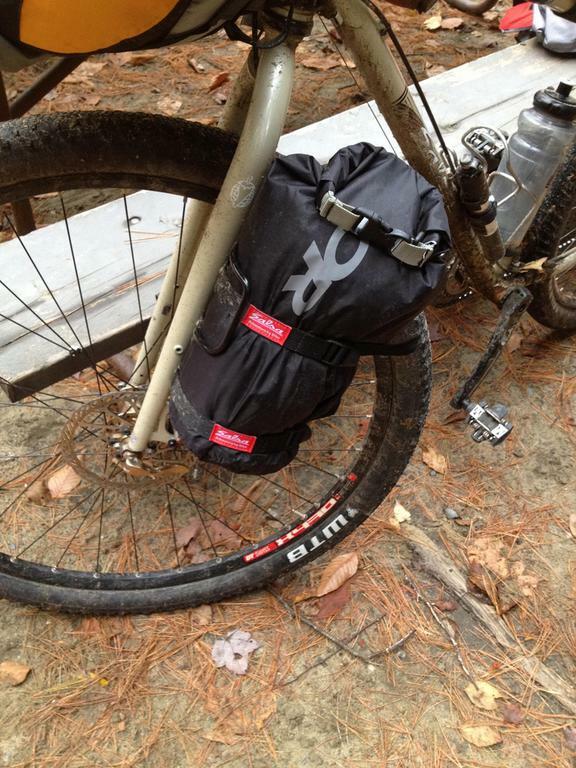 correct on lowrider rack, balance vs. clearance and you would be more limited on panniers, I would think you could only use clip-ons at that point, and not cruder drape-over bags or straps like what I used for the fuel cans. Great thread. I need another project like I need a hole in my heart, but I really like it. A thought: In Toronto, police auctions sell bicycles online starting at $1. Check how the local system works, you can find good stuff for well south of $30, and basic stuff under $10 (Great stuff usually going for significantly more). That's pretty dang neat and useful. 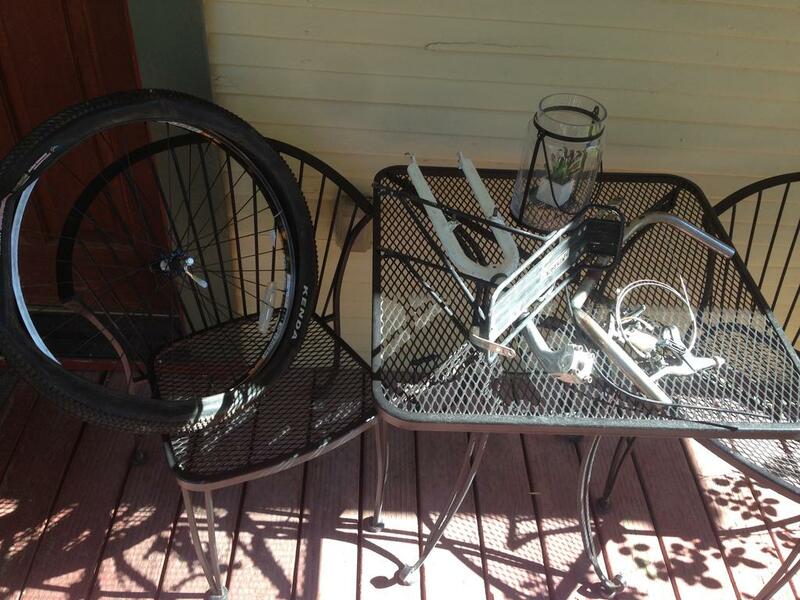 Complete bikes in my area can be found on Craigslist for about $20 so parts would be easy to come by. How so? I'm not sure you can rig up any kind of strap system as the cart requires active balance, and since there isn't any weight on the handles I'm not sure a strap would do anything. Most pull carts could have some kind of harness but I'm not sure how you'd rig one for a push cart. It is very similar to a Chinese wheelbarrow, but not a european one. Got the cart out and about some more today, went to a local walking spot with lots of rolling sandy hills and a pretty good ravine going though it. 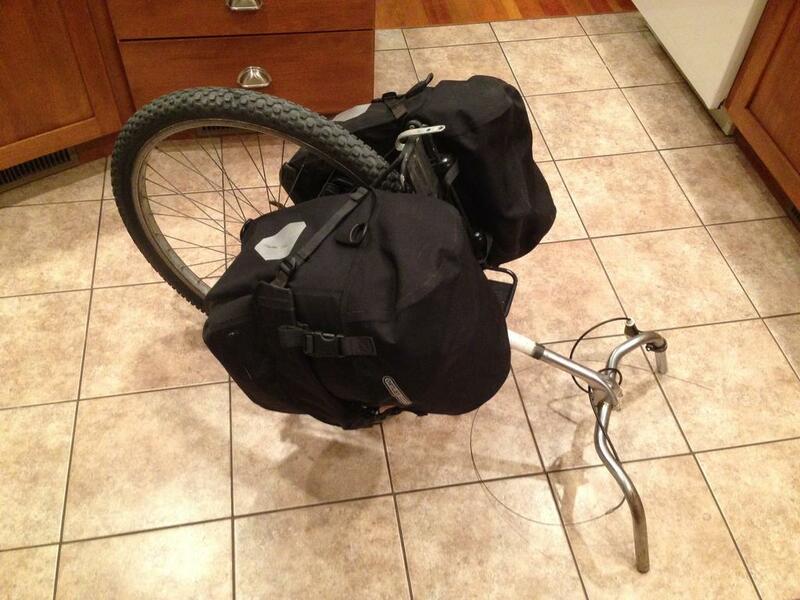 23.5lbs in one pannier, 24.5 in the other, so with the 10 lbs for the cart that comes to about 58lbs total. Wore a 15lb pound backpack with it just to round things out. Managed to fit most of my BOB in the panniers, plus an extra gallon of water just for ballast. Bulky stuff like the tent and sleeping bag where the only things left out, seems bulk is the limiting factor more then weight with a cart this small. Specifically trying to deduce whether brakes are needed or not. With the loose sandy soil the risk was actually for MY feet to loose traction and get pulled down the hill rather then the cart pulling away from me. Was definitely traction limited on this hill, as soon as I lost momentum I was just treading water on the sand. backed down and hit the hill at an angle, no sweat. with nearly 3/4 of the perimiter of the wheel exposed (as long as you don't go crazy with the load) It is pretty hard to be clearance limited front and back, even ditches deeper then the wheel you simply have to back through. 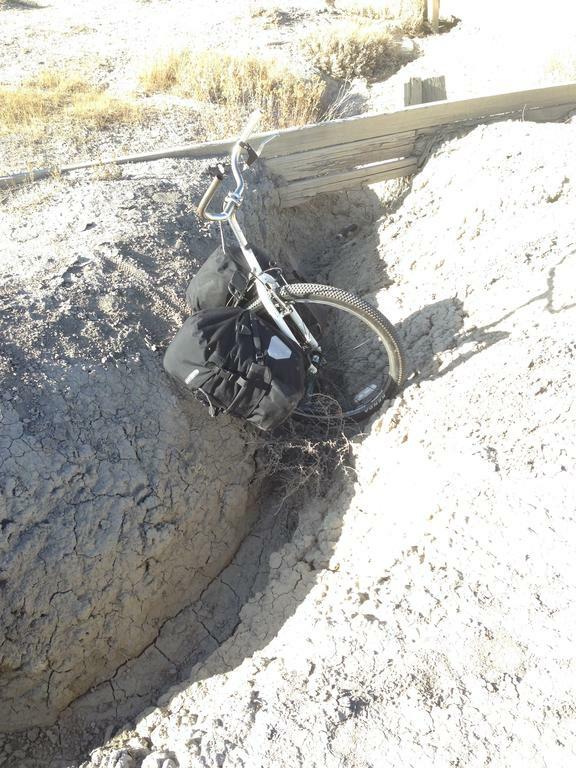 The panniers I am using don't extend below the axle so side to side clearence is actually pretty good too, I could push the cart along fully upright half way down this concrete channel without the bags rubbing. Even on the looser stuff the cart seemed to sidehill like a champ, certainly one of the big bonuses of a single wheel cart. Not sure how much a wider tire will help with traction but I'm still tempted to try. Noticed that the forces on the cart are much different then on a bike, so predicting failure and wear is going to be a different game. The major stress seemed to be mostly rotational on the handlebars as you maintain balance and aggressively turn the cart when turning around to back over/through something. Brakes actually seemed more important on the uphill sections then the down hill, as it tried to roll back on you if you paused at all. Also some kind of parking brake would be handy as it can try to get away from you when you stop. Because of the current balance point setting the cart down on the handlebars is pretty easy, and you are only picking up a few pounds when you pick it back up. As with a bike balance is much easier to maintain with a good forward clip. 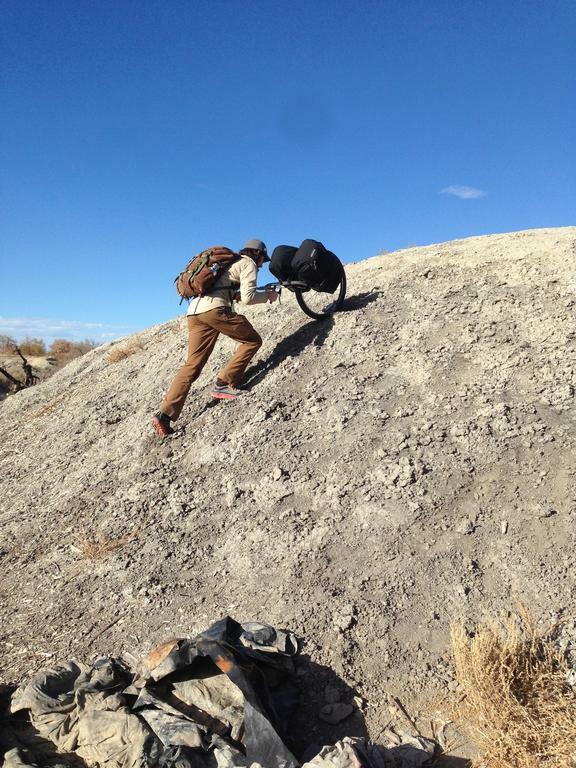 While walking on flat ground one hand or two fingers on each hand is easy, when stopped bracing it with a leg if you are trying to dig something out of your pocket is required. On one particularly steep, sandy hill I ended up simply dragging it up the hill on its side with one hand on the stem as I used the other hand to balance, taking it off the wheel gave it enough friction to not try to roll back down, and 60lbs is not too much to man handle for short distances. Certainly a two man team would be required for certain terrain (and a grab handle on the front would not go amiss). In the future I'd like to make a more universal cargo rack that was more friendly to just lashing on dry bags, the attachment points on most panniers is probably the weakest part of the whole system. Thanks for posting the test pics. 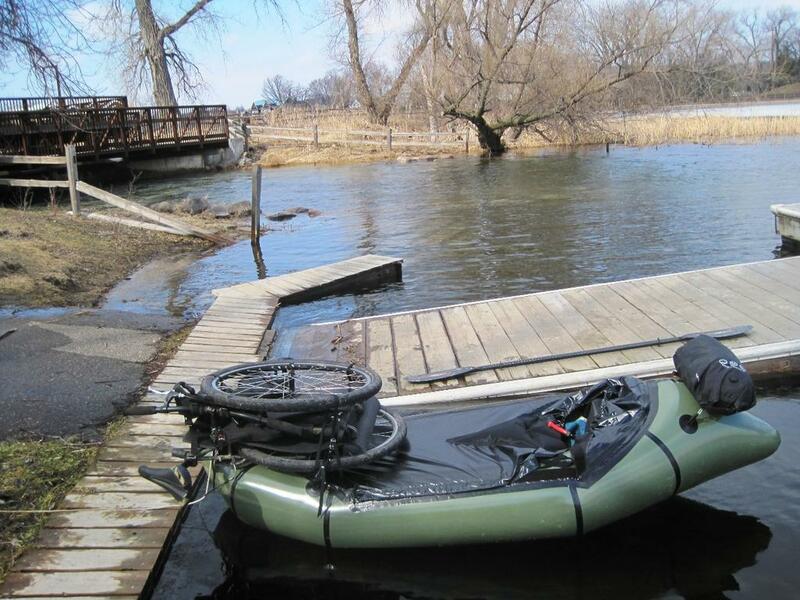 If we do a meet up in CO you're welcome to check out my Alpacka packraft sometime - just have to be by a body of water. the_alias wrote: Very cool, thanks for sharing! Thanks! I have access to a few locally, just haven't got out yet. I'd love to see more discussion about the practicality of a packraft in a BOB/PAW role, I can think up silly obscure uses, or practical but hyper-specific uses but would need more first hand experience before I speculated too much. In my purely hypothetical world it could potentially be part of the holy trinity of mobility; Cart, Sled, Raft. I would imagine the brakes would be critical for balance, especially when standing still. Certainly the brakes did seem more useful when trying to pause then for when trying to stop, especially on hills. On flat ground setting it back on the handlebars worked as well as anything. Very clever! 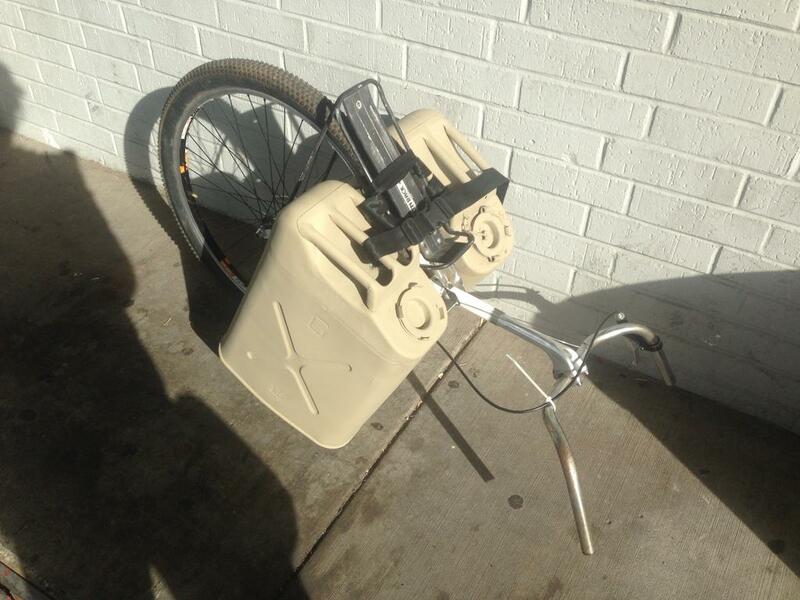 You've inspired me to build my own trailer for a recumbent trike I'll be purchasing soon. Never chase dangerous prey. Wait until it wanders into your kill zone. Get pics up when you do! A few more modifications to mine and I'll be starting a BO Bike thread. 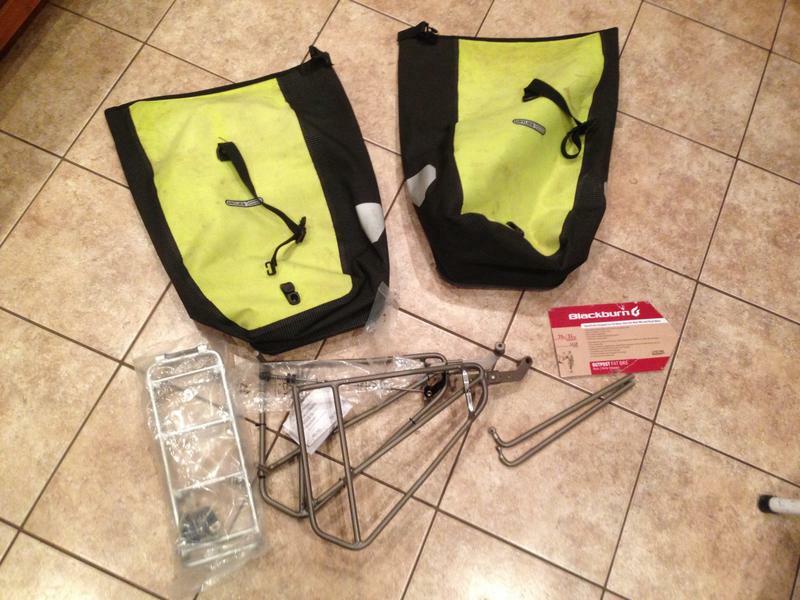 Got a lucky break today, stopped by REI today for the leftovers-of-the-garage-sale sale and found two pairs of Ortlieb panniers (labeled Front left/right and Back left/right, apparently someone outfitted for a big trip and didn't like them) and a fat bike cargo rack! only one pair of panniers show (my wife already had stolen the other pair for her bike) but that leaves me with 2 complete pairs of panniers that I can leave loaded with bug out supplies (they throw in the back of a car just as easily as on a bike or cart) and now if I can just find a fat bike fork and wheel I can have His and Hers carts. Loading the new panniers up with food (example food pods shown below), a stove, pot and extra water containers (MSR dromedary) I only hit 13lbs per pannier, as I suspected bulk limits are hit long before weight limits (new rack is rated for 70lbs, I'm sure it can do much more then that with the slower gentler pace of a cart). I might just have to load them up with straight rice, beans and other dry foods just to hit the weight limits. I'm loving this idea! One thing about brakes, which is handy on full bicycles too, is their ability to turn the bike into an impromptu leaning post. I used to keep toe straps on the handlebar so I could cinch the brake lever down when needed. Some of us who've been into bikes for a while most likely have these parts piled up anyway. I have a solid fork I bought for my Montague Paratrooper, and never used, and several wheels just leaning on a wall. Might be a good thing to try on the coming stormy weekend. I wonder... looking at how it's resting on the gas cans... if your panniers or other cargo aren't able to swivel like that, you can set up a couple cheap training wheels at an angle that will allow you to drop the handlebar and the cart will remain upright, and maybe a "tow" mode where you can keep both hands free and drag the thing behind you. A couple trauma plates between the panniers, and you can take cover behind the upright cart in a pinch. I'm at work and I'm bored. Please forgive me if I sound silly. got a killer deal on a Surly Pugsley wheelset that I couldn't turn down, and while I expect to have a bike they fit someday for now at least the front wheel is being put to work. 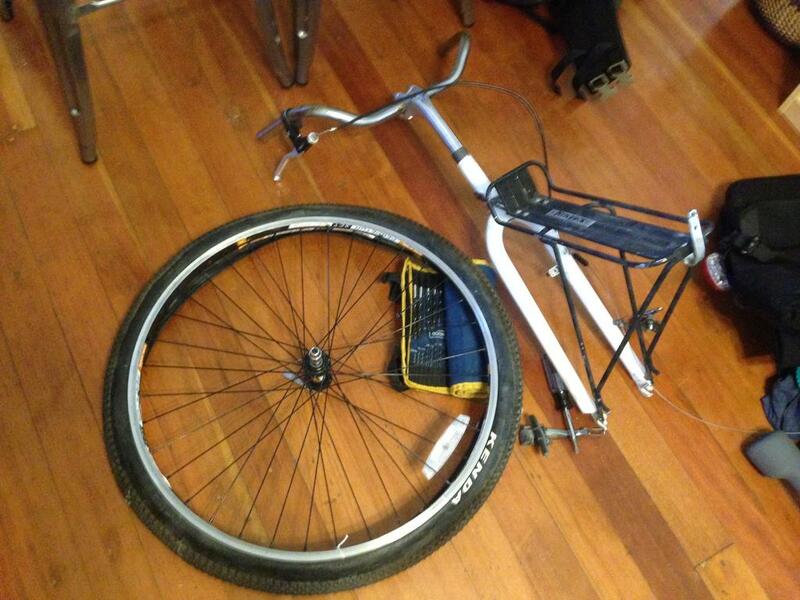 I had bought the Pugsley fork to potentially put on my Ogre for a fat front conversion, but the cart happened first. The Fat bike specific rack has tons of clearance, but puts the load noticeably wider and I will be looking for a narrower rack in the future. The maiden voyage was actually on the snow this time, since the weight on the wheel is quite a bit less then most fat bikes (50lbs ish rather then 100lbs+) it had quite a bit of float, certainly more then my trailrunners, and could even keep up with some smaller snowshoes. Its no pulk replacement for deep winter, but I think the overlap may be more then I had hoped. you can see how wide the panniers sit on the rack, the difference in leverage they had on the cart was noticeable. 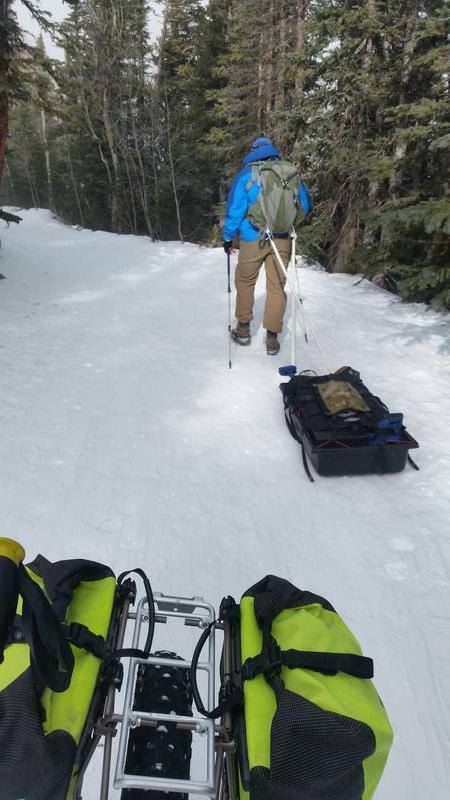 Got plenty of funny looks from skiers and splitboarders on the trail, as if the 75L pack on my back wasn't enough. two big takeaways: being in the cold reminded me of how little I trust the plastic hardware on the panniers, custom overkill panniers are in my future. secondly, bare metal handle bars are COLD. I had to glove and mitten up far beyond what the conditions would normally dictate, after I got home I was pretty quick to buy some cheap foamy grips to throw on for insulation. 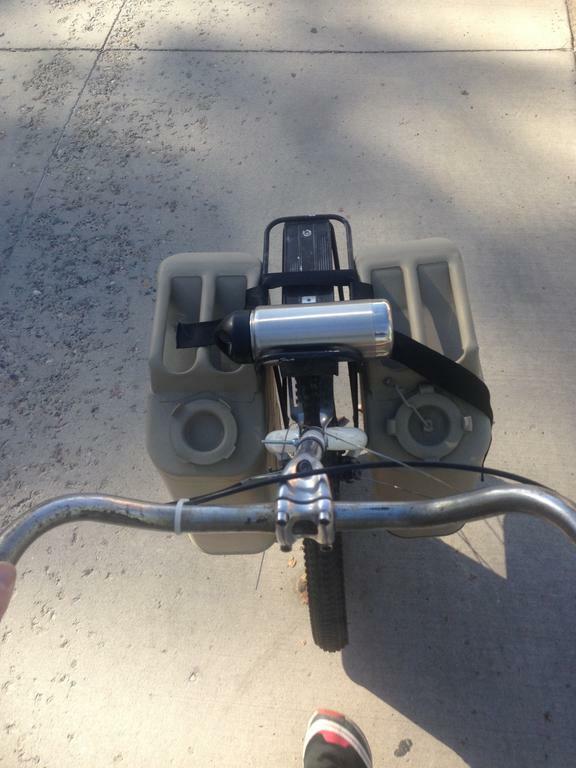 if you extended the handlebars a couple of feet, it would not be too hard to make it a pull cart. a lot of people when first trying out the cart try to turn it around and use it as a pull cart, but it absolutely does not work that way. with the load centered over the wheel it takes constant active balance to keep it up right, which is very easy when you can see it and have your arms in front of you, but a lot of work when it is out of sight, the cart wanders erratically and is far more prone to tipping. Look at the design of nearly every pull cart and you will see that they require the load to be split between the wheel and the handles to balance and stabilize more, but at the same time creating more work for the puller. Front load a wheelbarrow heavily and then try to pull it rather then push, you will quickly see what I mean. A push cart is far superior in most ways. RonnyRonin wrote: a lot of people when first trying out the cart try to turn it around and use it as a pull cart, but it absolutely does not work that way. with the load centered over the wheel it takes constant active balance to keep it up right, which is very easy when you can see it and have your arms in front of you, but a lot of work when it is out of sight, the cart wanders erratically and is far more prone to tipping. Look at the design of nearly every pull cart and you will see that they require the load to be split between the wheel and the handles to balance and stabilize more, but at the same time creating more work for the puller. with a normally loaded wheelbarrow pulling works fine, as it mimics the pull carts; load split between the wheel and the handles, it only gets bad when the load is balanced totally over the wheel. the advantage of a push cart is that with the load perfectly balanced your arms don't have to lift anything, and you can more easily steer around obstacles. Would shifting the rack/bags 'back' - toward you - make it more stable?